Stretching over four miles along the Baie des Anges, the Promenade des Anglais is home to the majority of Nice’s pebble-filled beaches. Fifteen private and 20 public beaches hug the bay, opening up to restaurants, water sports, and parasol-covered sun beds. While the private spots sport more luxurious amenities (think changing rooms, towels, and sun loungers), these beaches are seasonal and pop up only from April to October. Whether you’re looking for a playground with lifeguards or a seaside eatery where you can go from the bar to a beach bed, here are 10 of the top beaches in Nice to choose from. Formerly known as the Opéra Pavillion, Opéra Plage is Nice’s oldest private beach, originally debuting in 1889. Run for generations by the Maiffret family, Michel and his wife, Chantal, have taken the reigns and transformed the private beach into one of the most popular in Nice, where your wish is the staff’s command. Forgot your bikini? The sales assistant will glide over and give you a peek of her collection. Dreaming of a seaside massage? A masseur can be sent straight to your beach bed, which conveniently sits across from the Old Town on the Promenade des Anglais. The waterfront terrace also serves food from noon to 5 p.m. daily, offering cold plates that can be eaten beachside in one of 400 new deck chairs, available for rent from 9 a.m. to 6:30 p.m.
One of the newer private beaches to debut on Nice’s shores, Le Galet, named after the Côte d’Azur’s galets, or pebbles, is the epitome of Riviera chic. Think zen-like wooden shutters, navy beach beds, and sleek white parasols extending down to the sea. Officially open in season (April to October), the restaurant and beach bar welcome the lunch crowd as soon as the weather gets warm, which happens quite quickly in Nice. Located in the heart of the city across from the Old Town and Albert 1er gardens, this beach offers up one of the best views of the parade during carnival season in February. The location is one draw, but the food is definitely worth the visit alone. Take your pick of Italian-inspired fare from truffle-topped pizza to creamy slices of Buffalo mozzarella, and be sure to save room for a scoop of chantilly-topped homemade ice cream. Open from 10 a.m. until midnight from April to September, the private Castel Plage, which sits at the far end of the Promenade des Anglais under Castle Hill, is a top pick for those looking to spend an entire day basking by the water, pausing for lunch in between dips in the sea. Beach beds can be rented for half (17 euros) or full days (20 euros), but if you want to ensure you’ll have a bed ready and waiting when you arrive, call and reserve the day before (specifying which row you’d like). This is the kind of spot that’s perfect for lingering on Sundays in summer, sipping Provençal rosé while dining on the restaurant’s Niçois-inspired menu (which can be ordered seaside) with ingredients pulled right from the local market. The family-run Ruhl Plage debuted back in 1920 along the Promenade des Anglais near the Théâtre de Verdure and Albert 1er gardens. The Old World-inspired private beach features a saltwater pool for children (with a lifeguard on duty) and 80 private cabins equipped with showers. The beach opens daily from 9 a.m. to 12:30 a.m. and beds are available for rent (22€) from 9 a.m. to 7 p.m. The tucked-away lounge offers a menu of upscale beach fare (think salade Niçoise and burrata-topped pizza) from noon to 4:30 p.m., transforming into a tapas bar at 6 p.m. Diners can also find an extensive wine list heavy on local French favorites like Château Minuty’s infamous rosé. Open in season from May to September, Beau Rivage is a private beach with two very different sides: a zen outdoor restaurant opening up to sun beds and the lively lounge area with a new tapas menu and DJ spinning themed nights. Sitting at the foot of the Old Town on the Promenade des Anglais, Beau Rivage (which is open from 10 a.m. to midnight) draws a crowd of locals and tourists thanks to its prime location and sun-lounger menu courtesy of new seaside bistro, The Beachstraw. In the evening, the beach takes on a St. Tropez vibe with seaside soirées featuring themed parties and live music. Water sports fans can get their fix parasailing, wakeboarding, and waterskiing at Glisse Evasion, which sits right next to the private Blue Beach on the Promenade des Anglais. Blue Beach itself also offers water sports and is one of the few private places open year-round, featuring beach beds, a children’s swimming pool, and a seaside restaurant. During summer, the beach is open from 8 a.m. to midnight, and the restaurant is open for lunch and dinner. The rest of the year the beach shuts down by 7 p.m. Located near the Corsica ferry terminal near the port, Bains Militaires is more of a local secret since it’s in a residential side of town away from the bustling Promenade des Anglais. The former private military beach is now open to the public, but you won’t find any facilities (except for a shower) like on other beaches in town. The small strip of beach hugs the Club Nautique, which offers sailing lessons and lunch along the seaside terrace. While the beach lacks eateries of its own, you’ll find a few restaurants sitting a short stroll away along the port. The closest beach to the AC Hotel Nice, Voilier is considered one of the wider beaches along the Baie des Anges, with both public and private space for sunbathing, as well as a playground for children. The beach is open seasonally from 9:30 a.m. to 6 p.m., but travelers can visit the restaurant year-round for lunch, dining on Italian- and Mediterranean-inspired dishes like the infamous tagliata. In the evenings in summer, the beach club opens up for soirées that linger until 10 p.m.
Carras Beach, nestled near the airport on the western side of the Promenade des Anglais, is the only official pet-friendly beach, as well as one of the only handicap-friendly plages with wheelchair accessibility. From May to September, Jet Evasion offers jetskiing (making it the only in Nice to feature this water sport). The public beach lacks bathrooms and a restaurant, but there’s a lifeguard on duty daily during the summer and two free public parking lots near the port and La Lanterne beach. 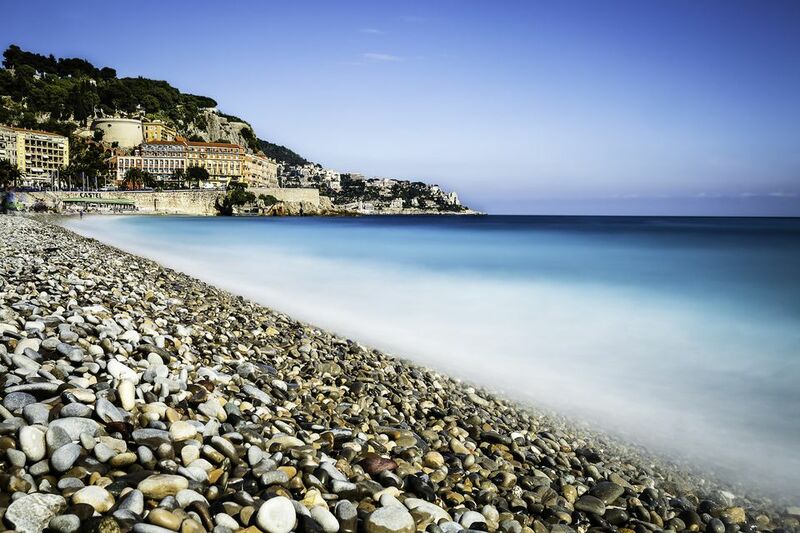 Drive east toward Monaco, and the first town you’ll come across is Villefranche-sur-Mer, whose crescent-shaped beach is a favorite for locals since pebbles are on the smaller side, resembling sand more than rocks. From the main train station in Nice, the ride is just 15 minutes to the beach, Plage des Mariniers. The shore is dotted with snack bar stands and a few seaside restaurants like Palm, but it’s worth venturing up to the Old Town to one of the stand-out eateries like Les Garçons. The beach in Villefranche is great for swimming (and snorkeling) since it’s easy to get in and out of the shallow water, but you won’t find facilities like bathrooms or lifeguards. Brittany is one of the most rugged and beautiful French regions. Check out this guide.